PLEASE NOTE: To receive information about your tractor, you must contact the Floyd County Historical Society directly. The MMCI cannot provide that information. We simply point you to the resource. Call 641-228-1099, or emailfchs@fiai.net, or go to www.floydcountymuseum.org. They are located in Charles City, IA. A large number of Minneapolis-Moline historical documents were moved from Minneapolis and Hopkins in the 1970’s. Many were left in Charles City when Allied took over WFE in the 1980’s. These ended up at the Floyd County Historical Society. MMCI has been working with the FCHS since 2004 to identify and preserve this information. The FCHS has been providing copies of manuals for a number of years and it is one of the main sources of income. A list of all of the manuals that are available is on the MMCI website. There is also a list of the Service Bulletins that FCHS can provide copies of on request. The 24 serial number books contain the records of when each tractor was built, its engine serial number and the various options it was built with by code number. Since there was not a master list of descriptions for the codes, it was necessary to determine what these code numbers were. 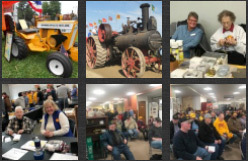 MMCI worked to collect price book pages for all of the tractors which list the code numbers and their description. This is now fairly complete with a few exceptions. Today you can obtain the history of your tractor by providing your serial number to the FCHS. They will provide a copy from the ledger book that shoes when your tractor was built, it’s engine serial number and the option codes. They will also provide a copy of the price pages for that model so you can find the description for the various ordering codes. The cost for this service is $20. The Minneapolis-Moline history is old and deteriorating. The MMCI board felt it was important to preserve this information and authorized a committee to work with FCHS to make this happen. Committee members are Loren Book, Phillip Fett, and Mike Verhulst. A signed working agreement with FCHS has been developed. FCHS is going to partition part of the basement to store MM records. After consultation with computer experts, software was leased by MMCI to scan the ledgers sheets to a CD disk while a copy is being made on FCHS copier. At this time all 24 tractor books (4000 pages) have been scanned and copied. See the NOTE at the top of this article for contact information to reach the Historical Society.